People often like to talk about old vs new media. What are the ramifications? Are the news stories the same? While I don't pretend to have the answers, I did decide to use a "new age" web tool named Wordl, which takes the content from any web page (or text you submit) and builds a graphical representation. In other words (or in other Wordls), this service turns text into a graphical representation. Research ... Not Just Another Twitter List! Although I've been a HUGE advocate of RSS technology over the years via this blog (still am), I realize that Twitter is here to stay. Like many of you, I've experimented with Twitter and am still learning the value proposition. I have found that one Twitter List which I have created, my Research List, has been a great way for me to stay informed about new reports in the knowledge domain of collaboration, systems and technology. I've restricted the membership to high quality research groups. I've included the initial list below along with their Twitter account links. Any like groups I should add, and why? Thanks. My home town of Duluth, Minnesota is trying to win the competition to have Google install a high speed fiber network for the entire community. 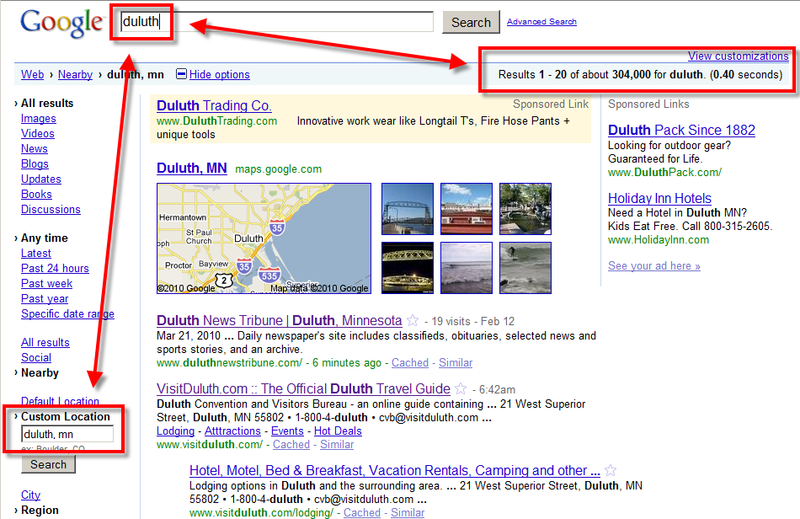 You may learn more about our effort via Google Twin Ports. If you happen to be a Google employee who is evaluating Duluth's application, I've created a Google Custom Search Engine which provides you a nice extract of what makes the Northland great. While you could use Google local search, even using that delimiter you would be presented with 304,000 results (a very high number with lots of "noise"). If desired, link to the search engine index to view the site list. You may browse from the index directly to any web site listed. LinkedIn Direct Ads .. A Threat to Google? Earlier this week upon logging in to my LinkedIn account, I noticed their Direct Ads. While I normally don't get excited about advertising, for some reason, I was curious. I decided to explore the service and ended up creating a short tutorial. The logical question is ... Why am I so intrigued with LinkedIn's direct advertisement service? As many of you know, I raced in my first Biathlon recently, and even placed first in the masters novice division. The sport impressed me with its demands for conditioning (skiing) and precision (shooting); however I'm not sure I'm ready for competition at the international level. This battle between the skiers from France, Russia, France and Germany for the top three places is truly amazing (video is only 46 seconds long).